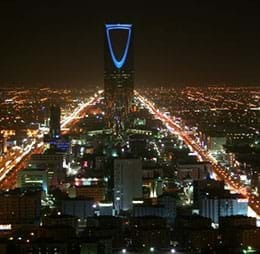 Riyadh, the capital of the Kingdom of Saudi Arabia, is situated in the center of the Arabian Peninsula. Rehlat offers wide range of cheap flights to Riyadh including one-way or round trip as well as provides daily schedules & information on non-stop flights to Riyadh. Get cheap Riyadh flights from all across the world and save huge money on your online booking. Enjoy a luxurious travel experience to taste the worldwide refinement and comfort to fly with world class airlines. Choose from the best selection of low cost flights to Riyadh from all around the world. Riyadh is the most enlightening place to visit. The Charming city boasts of many enchanting buildings and archaeology. While unwinding and discovering the unique beauty of Riyadh tourism, there are several tourist places in Riyadh including the Diplomatic Quarter reveals the cultural integration and urban planning. One of the old towers in Riyadh - Masmak Fort sits in the city centre and is a must visit along with the Deira Souq, Justice Square and the Governor’s Castle. Shopping malls in Riyadh contains wide variety of authentic collection of women apparel, home furniture, books, electronic gadgets, wallets, bags and shoes. For exclusive women shopping, among the 99 floors in the Kingdom Tower, the second floor is left open without allowing a single man inside. The Riyadh restaurants turn out the ethnic and stylish versions of real bistro-grill dishes. Riyadh cuisine offers a large variety of traditional dishes like the Marqooq, Matazeez, Qursan, and Jereesh which are few of the favorite dishes of Riyadh. The city exhibits the best Middle Eastern fast foods found all around Riyadh. Apart from food in Riyadh, there is no nightlife in Riyadh in the western sense like bars, night clubs or pubs, discotheques etc. There are all kinds of public and private local transportation facilities available connecting all parts of the city. There are two types of buses. They are: SAPTCO- government owned local buses runs within a specific route and to all the cities in the kingdom. Taxis, limousines and trains fall a part of the local travel at Riyadh. There are 5 major terminals at Riyadh International Airport along with a Royal Terminal. All terminals have basic and luxury amenities like washrooms to posh restaurants and duty free shops. Terminal 1 - This terminal is used for international flights, except flights operated by Air France, Korean Air, Saudi Airlines, and Middle East Airlines (Skyteam members and flynas). Terminal 2 - This terminal is used for international flights with the exception of the flynas members and skyteam. Terminal 3 - This terminal is currently closed for international flights but it’s been used for domestic flights. Saudi Arabian Airlines, Nas Air and Sama Airline use this terminal. Terminal 4 – Not used till date. Terminal 5 – This terminal was opened in 2016. The terminal is adjacent to the other ones, and handles domestic flights that operate with 5 different destinations inside the country. This terminal directly connects to the Metro and has a big parking space. The Royal Terminal – This terminal is reserved for Heads of State and other VIP personalities: the Royal Pavilion. There are many options to travel from any part of the city to the Riyadh airport. The ground transportation to airport includes renting cars, Metered taxis, and free shuttle services.